A caterpillar can eat up to three hundred times its own weight in a day, devastating many plants in the process, continuing to eat until it’s so bloated that it hangs itself up and goes to sleep, its skin hardening into a chrysalis. 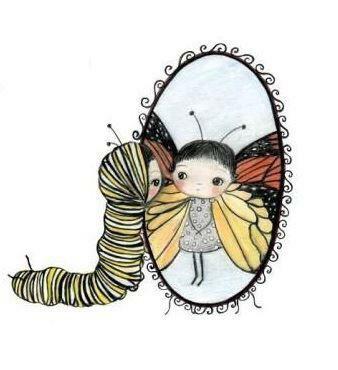 Then, within the chrysalis, within the body of the dormant caterpillar, a new and very different kind of creature, the butterfly, starts to form. This confused biologists for a long time. How could a different genome plan exist within the caterpillar to form a different creature? They knew that metamorphosis occurs in a number of insect species, but it was not known until quite recently that nature did a lot of mixing and matching of very different genome/protein configurations in early evolutionary times. Cells with the butterfly genome/ proteins were held as aggregates, or ‘discs’ of stem cells that biologists call ‘imaginal cells’, tucked inside pockets of the caterpillar’s skin all its life, remaining undeveloped until the crisis of overeating, fatigue and breakdown allows them to develop. Such metamorphosis makes a good metaphor for the great changes globalisation, in the sense of world transformation, is bringing about., as Norie Huddle first used it in her children’s book Butterfly. Our bloated old system is rapidly becoming defunct while the vision of a new and very different society, long held by many ‘imaginal cell’ humans who dreamt of a better world, is now emerging like a butterfly, representing our solutions to the crises of predation, overconsumption and breakdown in a new way of living lightly on Earth, and of seeing our human society not in the metaphors and models of mechanism as well-oiled social machinery, but in those of evolving, self-organizing and intelligent living organism. I love the idea of imaginal cells. It never ceases to amaze me what we can learn from nature and how many life lessons are right under our noses! Anyway that was Elisabet’s lovely story and now we can zoom in and see it from the viewpoints of the caterpillars! ← My approach to healing..
Justina, Thank you for the wonderful story and Elisabet’s take on human evolution…Imaginal cells. Awesome!